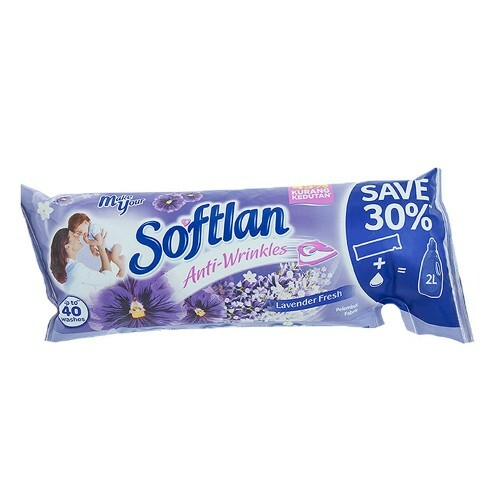 Tags: Softlan, Fabric Conditioner . Softlan Lavender Fresh Fabric Conditioner now comes in an Eco Pack for more savings and more value while staying kind to the environment! With the Eco Soft Pack, you just have to add water to get 2 liters of this wonderful fabric conditioner. It protects your fabrics by coating and nourishing them, making your clothes smelling fresher and feeling softer for easy ironing! Softlan Anti-Wrinkles Floral Fantasy Fabric Softener protects your fabrics by coating and nourishing them, leaving clothes softer, fresher and easier ..
Softlan Aroma Therapy Passion Fabric Conditioner is preferred by mothers throughout Malaysia. This fabric conditioner is equipped with an aromatherapi..